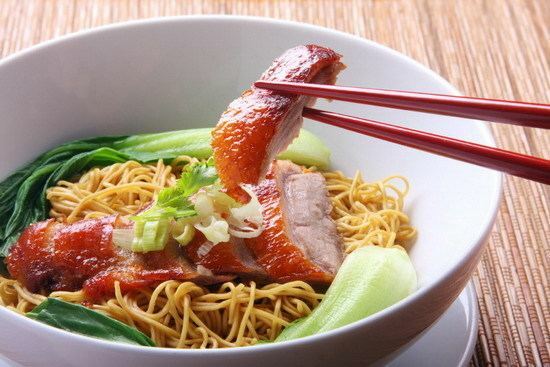 Chinese cuisine is an important part of Chinese culture, which includes cuisines originating from the diverse regions of China, as well as from Chinese people in other parts of the world. 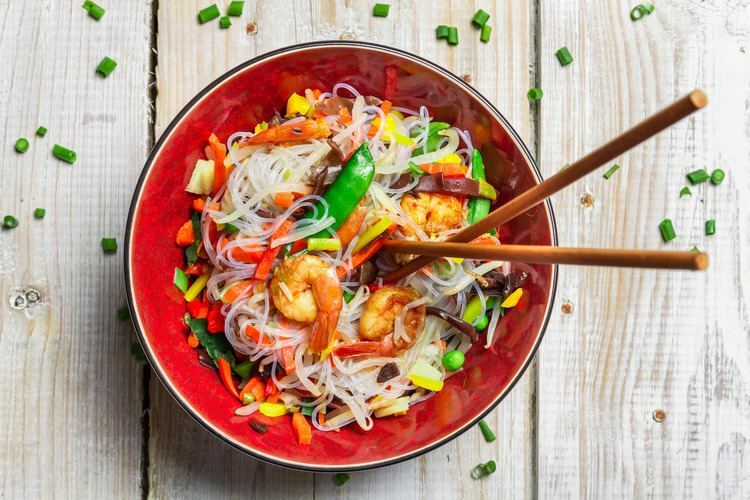 Because of Chinese diaspora, Chinese cuisine has influenced many other cuisines in Asia, and evolved into a new Chinese/American cuisine separate from that of China and the rest of Asia. The most praised "Four Major Cuisines" are Chuan, Lu, Yue and Huaiyang, represents West, North, South and East China cuisine correspondingly. Modern "Eight Cuisines" of China are Anhui, Cantonese, Fujian, Hunan, Jiangsu, Shandong, Sichuan, and Zhejiang cuisines. The color, smell and taste are the three traditional aspects to describe Chinese food, also the meaning, shape and nutrition. While, cooking should be appraised from ingredients, cuttings, cooking time and seasoning. It is considered inappropriate to use knives on dining table. Chopsticks are the main eating utensils for Chinese food, which can be used to cut and pick up food. Chinese society greatly valued gastronomy and developed an extensive study of the subject based on its traditional medical beliefs. Chinese culture initially centered around the North China Plain. The first domesticated crops seem to have been the foxtail and broomcorn varieties of millet, while rice was cultivated in the south. By 2000 BC, wheat had arrived from western Asia. These grains were typically served as warm noodle soups, however, instead of baked into bread as in Europe. Nobles hunted various wild game and consumed mutton, pork, dog, and beef as these animals were domesticated. Grain was stored against famine and flood and meat was preserved with salt, vinegar, curing, and fermenting. The flavor of the meat was enhanced by cooking it in animal fats though this practice was mostly restricted to the wealthy. 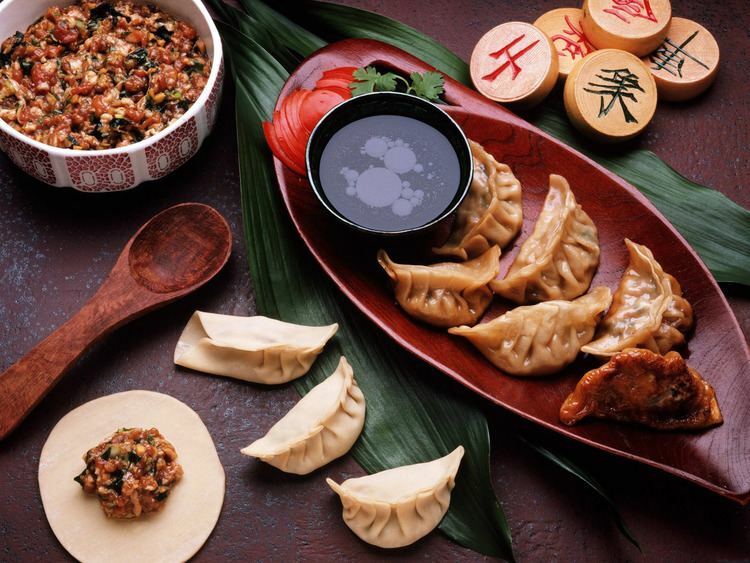 By the time of Confucius in the late Zhou, gastronomy has become a high art. He was recorded discussing about the principles of dinning: "The rice would never be too white, the meat would never be too finely cut... When it was not cooked right, man would not eat. When it was cooked bad, man would not eat. When the meat was not cut properly, man would not eat. When the food was not prepared with the right sauce, man would not eat. Although there are plenty of meat, they should not be cooked more than staple food. There is no limit for alcohol, before a man get drunk." During Shi Huangdi's Qin dynasty, the empire expanded into the south. By the time of the Han Dynasty, the different regions and cuisines of China's peoples were linked by major canals and leading to greater complexity in the different regional cuisines. Not only is food seen as giving "qi", energy, but food is also about maintaining yin and yang. The philosophy behind it was rooted in the I Ching and Chinese traditional medicine: food was judged for color, aroma, taste, and texture and a good meal was expected to balance the Four Natures ('hot', warm, cool, and 'cold') and the Five Tastes (pungent, sweet, sour, bitter, and salty). Salt was used as a preservative from early times, but in cooking was added in the form of soy sauce, and not at the table. The predominance of chopsticks and spoons as eating utensils also necessitated that most food be prepared in bite-sized pieces or (as with fish) be so tender that it could be easily picked apart. By the Later Han period (2nd century), writers frequently complained of lazy aristocrats who did nothing but sit around all day eating smoked meats and roasts. During the Han dynasty, Chinese developed methods of food preservation for military rations during campaigns such as drying meat into jerky and cooking, roasting, and drying grain. Chinese legends claim that the roasted, flat bread shaobing was brought back from the Xiyu (the Western Regions, a name for Central Asia) by the Han dynasty General Ban Chao, and that it was originally known as hubing (胡餅, lit. "barbarian bread"). The shaobing is believed to be descended from the hubing. Shaobing is believed to be related to the Persian and Central Asian naan and the Near Eastern pita. Foreign westerners made and sold sesame cakes in China during the Tang dynasty. As part of the last leg of the Columbian Exchange, Spanish and Portuguese traders began introducing foods from the New World to China through the port cities of Canton and Macao. Mexican chili peppers became essential ingredients in Sichuan cuisine and calorically-dense potatoes and corn became staple foods across the northern plains. During the Qing Dynasty, Chinese gastronomes such as Yuan Mei focused upon a primary goal of extracting the maximum flavor of each ingredient. As noted in his culinary work the Suiyuan shidan, however, the fashions of cuisine at the time were quite varied and in some cases were flamboyantly ostentatious, especially when the disply served also a formal ceremonial purpose, as in the case of the Manchu Han Imperial Feast. 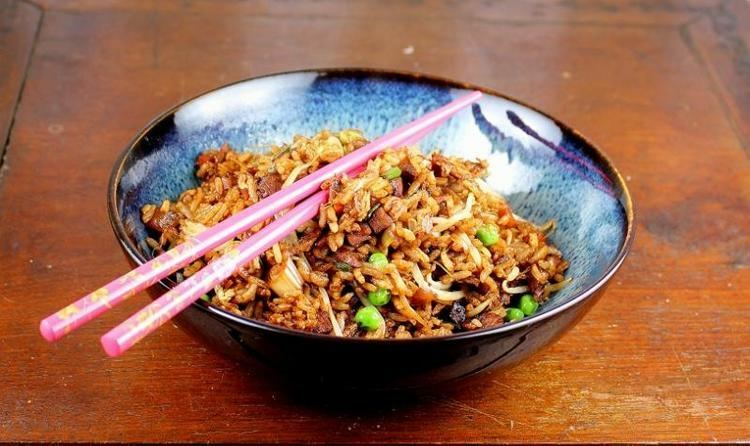 As the tempo is getting faster in modern China, fastfood like fried noodles, fried rice and gaifan (dish over rice) become more and more popular. Cooking is an art, recipes sprout out of creativity and imagination or even borrowing a leaf from other cultures. Rice is a major staple food for people from rice farming areas in southern China. Steamed rice, usually white rice, is the most commonly eaten form. Rice is also used to produce beers, wines and vinegars. Rice is one of the most popular foods in China and is used in many dishes. Glutinous rice ("sticky rice") is a variety of rice used in many specialty Chinese dishes. In wheat-farming areas in Northern China, people largely rely on flour-based food, such as noodles, breads, jiaozi (a kind of Chinese dumplings), and mantou (a type of steamed buns). 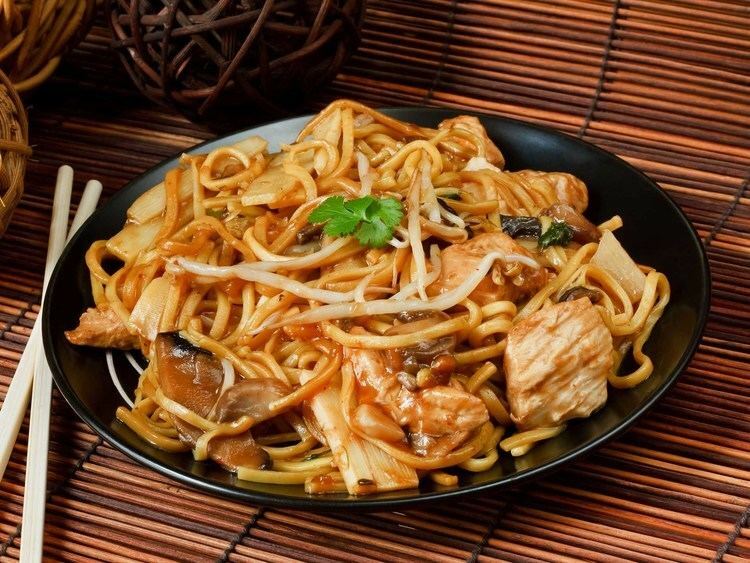 Chinese noodles come dry or fresh in a variety of sizes, shapes and textures and are often served in soups or fried as toppings. Some varieties, such as Shou Mian (寿面, literally noodles of longevity), are symbolic of long life and good health according to Chinese tradition. Noodles can be served hot or cold with different toppings, with broth, and occasionally dry (as is the case with mi-fun). Noodles are commonly made with rice flour or wheat flour, but other flours such as soybean are also used. Tofu is made of soybeans and is another popular food product that supplies protein. The production process of tofu varies from regions to regions, resulted in different kinds of tofu with a wide range of texture and taste. 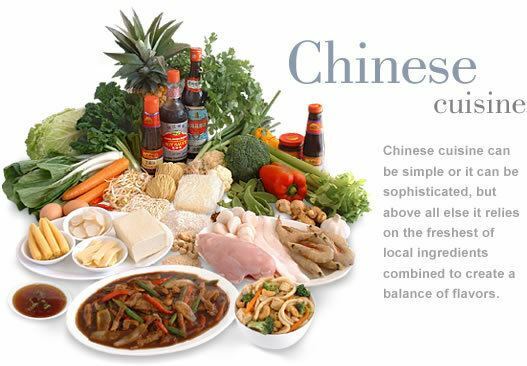 Other products such as soy milk, soy paste, soy oil, and fermented soy sauce are also important in Chinese cooking. Stinky tofu is fermented tofu. Like blue cheese or durian, it has a very distinct, potent smell, and is an acquired taste. Hard stinky tofu is often deep-fried and paired with soy sauce or something salty and spicy. Soft stinky tofu usually be used as a spread on steamed buns. Apart from vegetables can be commonly seen, some unique vegetables used in Chinese cuisine include Chinese leaves, bok choy, dao-mieu (pea seedling), choy sum, on choy, yu choy, bitter melon, and Gai lan or Chinese broccoli and so on. Other vegetables including bean sprouts, pea vine tips, watercress, lotus roots and bamboo shoots are also used in different cuisines of China. Seasonings such as fresh ginger root, garlic, scallion, white pepper, and sesame oil are widely used in many regional cuisines. Sichuan peppercorns, star anise, cinnamon, fennel, cilantro, parsley, and cloves are also used. To add extra flavors to dishes, many Chinese cuisines also contain dried Chinese mushrooms, dried baby shrimps, dried tangerine peel, and dried Sichuan chillies. 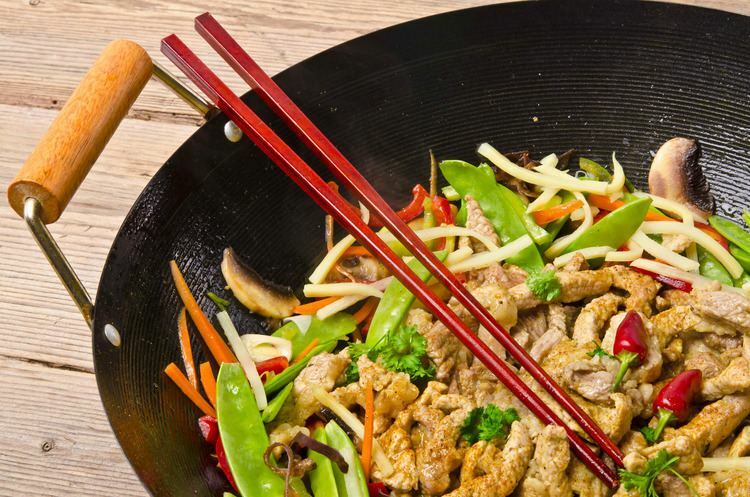 When it comes to sauces, China is home to soy sauce, which is made from fermented soy beans and wheat. Oyster sauce, clear rice vinegar, chili, Chinkiang black rice vinegar, fish sauce and fermented tofu (furu) are also widely used. A number of sauces are also based on fermented soybeans, including Hoisin sauce, ground bean sauce and yellow bean sauce. Dim Sum (点心), originally means small portion of food, can refer to dessert, pastries. Later to avoid the disambiguation, tian dian (甜点) and gao dian (糕点) are used to describe desserts and pastries. Chinese desserts are sweet foods and dishes that are served with tea, along with meals, or at the end of meals in Chinese cuisine. A wide variety of Chinese desserts are available, mainly including steamed and boiled sweet snacks. Bing is an umbrella term for all breads in Chinese, also including pastries and sweets. These are baked wheat flour based confections, with different stuffings including red bean paste, jujube and various of others. Su (酥) is another kind of pastry made with more amount of oil, making the confection more friable. Chinese candies and sweets, called táng (糖) are usually made with cane sugar, malt sugar, honey, nuts and fruit. Gao or Guo are rice based snacks that are typically steamed and may be made from glutinous or normal rice. Chinese dessert soups typically consist of sweet and usually are hot soups. There are also western pastries in China, like mille-feuille, crème brûlée and cheesecake, but not many of them are welcomed. Because the Chinese preference of dessert is mildly sweet and less oily. Chinese in earlier dynasties evidently drank milk and ate dairy products, although not necessarily from cows, but perhaps koumiss (fermented mare's milk) or goat's milk. Tapioca pudding and "double-skin milk" as dessert is also quite popular. Many Chinese until recently have avoided milk, partly because pasturage for milk producers in a monsoon rice ecology is not economic. Ice cream is commonly available and popular throughout China. Chinese sausages vary from region to region. The most common sausage is made of pork and pork fat. Flavor is generally salty-sweet. Chinese sausage is prepared in many different ways, including oven-roasting, stir-fry, and steaming. In some part of South China, soups are served between the cold dishes and main dishes. In the rest part of China, soups are served between the main dish and staple foods, before desserts or fruit salad. Tea plays an important role in Chinese dinning culture. Baijiu and huangjiu as strong alcoholic beverages are preferred by many people as well. Wine is not so popular as other drinks in China that consumed during dinning, although they are usually available in the menu. Chinese tea is often classified into several different categories according to the species of plant from which it is sourced, the region in which it is grown, and the method of production used. Some of these types are green tea, oolong tea, black tea, scented tea, white tea, and compressed tea. There are four major tea plantation regions: Jiangbei, Jiangnan, Huanan and the southwestern region. Well known types of green tea include Longjing, Huangshan, Mao Feng, Bilochun, Putuofeng Cha, and Liu'an Guapian. China is the world’s largest exporter of green tea. Soya milk, almond milk, walnut milk and coconut milk are also drunk during the meal in different regions. Juice of hawthorn, jujube are some region's preference. Small shot of fruit vinegar is served as appetizer in Shanxi. The initial attempts of the People's Republic of China to modernize Mainland China's productive but labor-intensive agricultural practices led to a series of debacles: the worst, the Great Leap Forward, produced such widespread famines from 1958 to 1961. Practices and technology were slowly modernized, however, and from the introduction of economic reform by Deng Xiaoping in the late '70s, Chinese diets have steadily become richer over time and include more meats, fats, and sugar than before. According to the United Nations' Food and Agriculture Organization, China's per capita food consumption has increased from less than 1700 kcal in 1960 to 2570 kcal per day in 1995. Where there are historical immigrant Chinese populations, the style of food has evolved and been adapted to local tastes and ingredients, and modified by the local cuisine, to greater or lesser extents. This has resulted in a number of forms of fusion cuisine, often popular in the country in question. Some, such as ramen (Japanese Chinese cuisine) have become popular internationally. Deep fried meat combined with sweet and sour sauce as a cooking style receives an enormous preference outside of China. Therefore, many similar international Chinese cuisines are invented based on sweet and sour sauce, including Sweet and sour chicken (Europe and North America), Manchurian chicken (India) or tangsuyuk (South Korea). The large Chinese population in the United States operates many restaurants, has developed distinctive dishes (such as chop suey) based originally on Cantonese cuisine, while those are not popular among American Chinese people. The Chinese dining etiquette has that youths should not sit at the table before the elders. In addition to this, youths should not start eating before the elders start eating. When eating with a bowl, one should not hold it with its bottom part, because it resembles the act of begging. Also, when taking a break from eating at the table, one should not put the chopstick into the rice vertically, because it resembles the Chinese traditional funeral tribute, which involves putting chopstick inside a bowl of rice vertically. Chinese dishes stress the three main points of appearance, smell, and taste. A really well-cooked Chinese food would need to achieve all three of them. Also, there is teaching of food carving in Chinese culture, typically using vegetables as materials to carve the sculpture for animals and spiritual beings.